While I was busy planning and scheming and drawing up our plan of attack for the trip to Hawaii, Cari made sure to tell me that she wanted some down time so that she could just relax on the beach and/or by the pool and maybe get a massage and other non-active stuff like that. No problem. I thought such a day might give me a chance to go do something that she wasn’t too interested in, like exploring the northwest side of the island or maybe checking out the Maui Ocean Center and Aquarium. But, in reality, once I’d experienced snuba and snorkeling on day two of our trip, I knew how all my free time would be spent. In the water. Looking for sea turtles. So that’s how the day began: Cari and I went snorkeling right off of Ka’anapali Beach around the Black Rock area right below our room. The weather was gray and rainy and few people were out in the water with us. We spent close to an hour out there, had a great swim and saw a lot of gorgeous fish … but no sea turtles. Sigh. After snorkeling, we headed down to Lahaina to try out a restaurant that my friend, Scott, had highly recommended for its burgers: the Cool Cat Cafe. We both ordered burgers for lunch, and they were amazing. Seriously, one of the best burgers I’ve ever had. And it was huge. Couldn’t even touch the onion rings that I’d ordered with it. If you like burgers, don’t miss the Cool Cat Cafe. The restaurant sits up on the second level of a group of stores and businesses, and they sat us right out along the open-air deck with a very cool view of the busy streets below us. 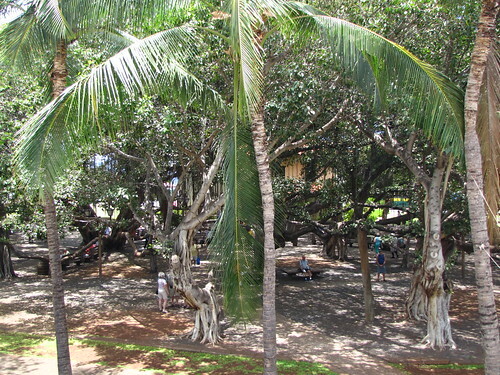 We were also seated right across from the famous banyan tree in Lahaina, which was pretty interesting to look at … but dare I say, not as interesting as it’s made out to be in the literature. Definitely stop by and have a look, but don’t plan on spending a ton of time. 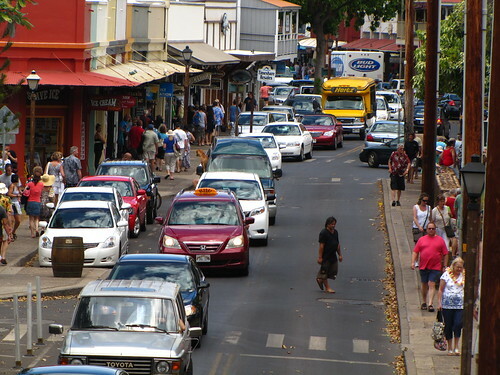 After lunch, we walked around Lahaina a bit and then headed back to the hotel. Cari had a massage appointment, and I had decided to head back down to the water for another sea turtle search. 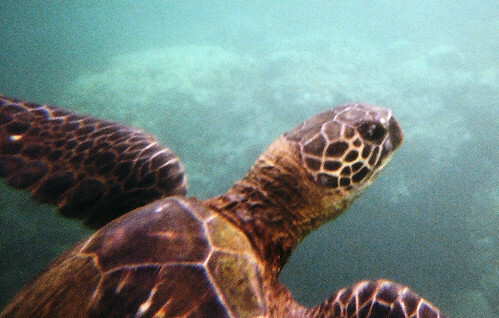 I brought the second underwater disposable camera with me this time — optimistic about my chances of seeing my favorite animal. And, as the headline above already told you … I saw one!!!! I was so dumbfounded with awe when it started swimming right toward me that I couldn’t even bring myself to shoot a photo. So that shot above is after the turtle had passed me. (That’s her backside, if you need to know.) She wasn’t moving quickly, and I eventually caught up to her and got this really close shot. 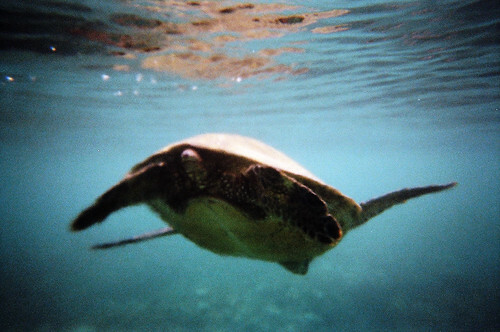 Altogether, I swam with this sea turtle for about 30 seconds or so before she was headed out toward deeper waters than I was willing to visit. You should’ve seen the perma-grin on my face after that. I was the happiest guy in Hawaii. I rushed back to the hotel, but Cari was still getting her massage. So I called both my kids and I’m sure I was squealing like I’d just seen The Beatles or something in 1964. Then, when Cari finally got back to the room, the first words out of my mouth were: “We can go home now.” I’d accomplished everything I wanted to on this trip. It was that awesome. 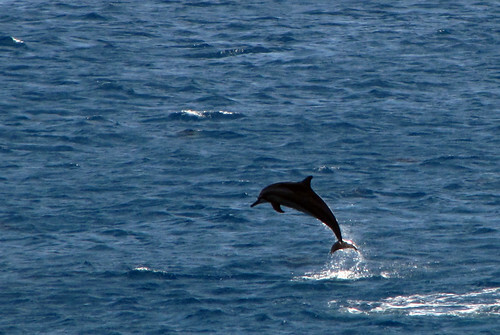 Not long after that, Cari was sitting out on the balcony … excuse me, the lanai … and suddenly rushed into the room to tell me there were dolphins swimming by. I grabbed the camera and, sure enough, there must’ve been about two dozen swimming together, a couple of them jumping out of the water as they went along. 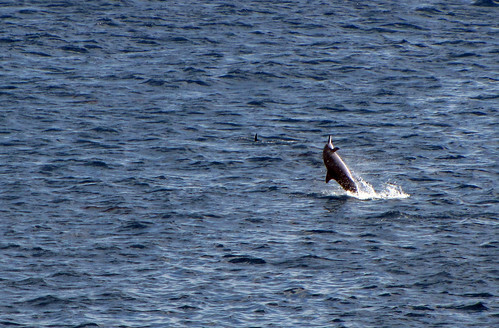 Seeing these dolphins was a complete rush … what a day this turned out to be for sea creatures and the McGees. Unbelievable. We eventually went down the beach to Whaler’s Village and had a late dinner at Hula Grill. It was good, but maybe not as good as advertised. But again, the view was amazing — you’re sitting right on the sand. Literally. Our chairs and table were on sand. We walked around and did some shopping in Whaler’s Village, then back to the hotel and called it a night. Back out more fun tomorrow — an early morning zipline tour is on the itinerary.